Patsy Calhoun has always been a giving person. When it comes to the fight against breast cancer, the battle is a bit more personal. “I have friends and I’ve had family that’s had breast cancer,” she explained. When the Crowley woman got a letter from the Breast Cancer Survivors Foundation, she said giving was a no-brainer. She mailed the foundation a check for $27 and included a note saying that it was all she could afford. The following month she received another letter asking for more. She thought it was odd and decided to check her bank statement to make sure they received the first check. “It showed that the check had been cashed, but there was no name as to who got the $27," Calhoun said. "No one endorsed it. There was no name shown on the account, just an account number and routing number." "That's when I got skeptical," she said. According to New York Attorney General Eric Schneiderman, the Breast Cancer Survivors Foundation is a big "sham." Investigators found that more than 90 percent of the money donated was funneled to Mark Gelvan, its outside fundraiser, as well as Gelvan's other companies and business associates. Less than 4 percent of the money raised by the foundation went to medical care. "There are few things more galling than pretending to help cancer patients, when you're really just lining your own pockets," said Schneiderman. "But that's exactly what those behind the Breast Cancer Survivors Foundation did." 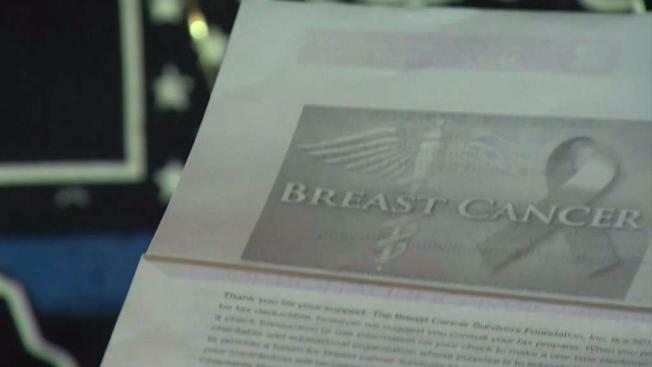 Under a legal settlement, the foundation will cease operations nationwide and pay $350,000 to "legitimate" breast cancer organizations. Dr. Yulius Poplyansky, the president and founder of BCSF, publicly apologized to donors and breast cancer survivors, saying in part: "I now understand that I had no idea what was going on in my own foundation and that my desire to help people was taken advantage of by people that just wanted to make money off this very serious cause." Mark Gelvan has not returned our calls. It's a lesson learned for Patsy Calhoun, who won't stop giving, but will be more cautious when donating. “Because there's so much scamming going on nowadays,” she said. • Get the exact name of the organization and do research by searching the name of the organization online. • Warning: Some fake charities will use names that are similar to legitimate organizations in an effort to trick donors. • Call the charity. Find out if the organization is aware of the solicitation and has authorized the use of its name. The organization’s development staff should be able to help you. • You can also contact the National Association of State Charity Officials. This association oversees charitable organizations and charitable solicitation in the United States.